Beardy’s & Okemasis’ Cree Nation, Treaty 6 – With a few simple words, the Referendum Officer, Mr. Irvin Montana, announced that the people of the Beardy’s & Okemasis’ Cree Nation had set themselves on a path toward self-determination. Since 2014, Yahkohtewin Governance Planning Committee members Councillor Kevin Seesequasis, Councillor Jeremy Seeseequasis, Chief C. Roy Petit, Elders Betsy Gamble, Suzanne Seeseequasis, Charlie Sutherland, and Angus Esperance have worked with legal consultant Koren Lightning-Earle to further develop the legislation with community input through formal readings and surveys. Constitution: Yes = 221 votes, No = 24 votes. Executive Act: Yes = 222 votes, No = 21 votes. Financial Management Act: Yes = 233 votes, No = 12 votes. 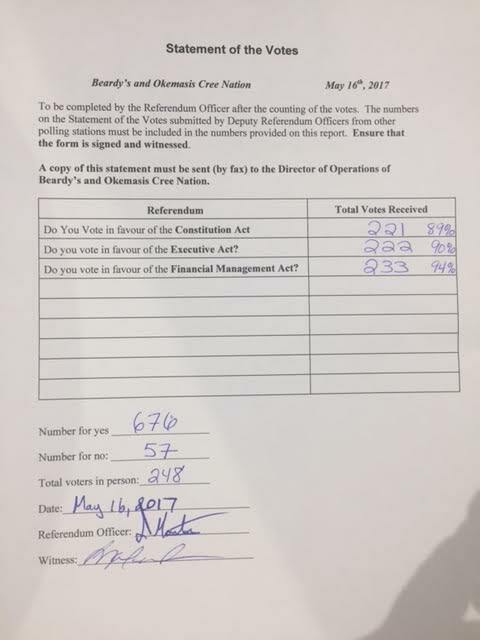 “The new Constitution of the Beardy’s & Okemasis’ Cree Nation stipulates that in order to enact new legislation, a 50% + 1 threshold of ballots cast must be in favour. This time around, we achieved that.” concluded Councillor Gardipy-Bill. The new Constitution, Executive Act, and Financial Management Act are now official legislation for the Beardy’s & Okemasis’ Cree Nation alongside the recently amended Election Act. You can view the legislation here. I would like to congratulate and thank Chief and Council four their work at getting this in place. I appologize I couldn’t be their to vote as I have hurt myself.